Rwanda is among the top African countries that intercept stolen vehicles. The Rwanda National Police says culprits fall into traps when they attempt to use Rwanda either as a destination or transit route for stolen vehicles and other items. 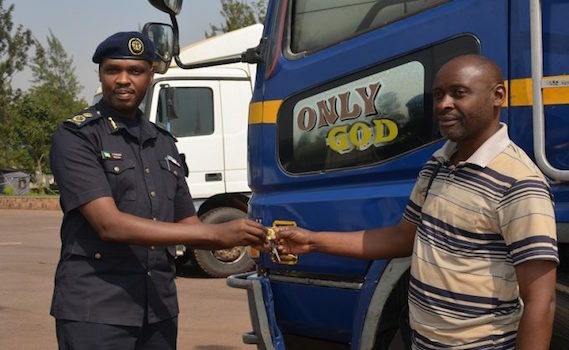 The Commissioner for Interpol at Rwanda National Police, Assistant Commissioner of Police (ACP) Peter Karake says the country is placed among top African countries that have intercepted many stolen vehicles. This, he says, is attributed to the effective use of high-tech I-24/7 Interpol communication rolled out at all Rwanda’s border posts connected to the customs. On Monday June 11, 2017, a stolen vehicle, a RAV4 was intercepted at Ruhwa border post with Burundi in Rusizi District as it entered into Rwanda. The vehicle was intercepted with the help of Interpol’s I-24/7 communication system, which connects all the 190 Interpol member countries to track stolen items and fugitives, among others. The I-24/7 log indicated the vehicle bearing Congolese number plates and reportedly stolen from Kenya in 2014. Last year alone, out of the reported 26,000 stolen motor vehicles (SMV) searches, the Rwanda National Police intercepted 11. Since the beginning of this year, the Rwanda National Police has intercepted seven stolen vehicles that crossed into Rwanda. “The intercepted stolen vehicles come from different parts of the world. Among the vehicles we have intercepted and yet to be handed over, include three from South Africa, one from Belgium, one from Poland, three from Japan, one from Italy, one from France, one from Kenya and a motorcycle from UK,” ACP Karake said. Stolen motor vehicles are one of the transnational crimes which, according to ACP Karake. “The world today is increasingly facing changing trends in security systems. Emerging threats have affected some states and criminals are operating with no border limits. To deal with such a situation, we all embarked on international cooperation mainly through Interpol as means combat transnational crimes,” he said. The Commissioner said the country is strengthening its capacity in the fight against cross-border and transnational organized crime through enhancing cooperation with other police institutions and organization globally.